There are many reasons why it's worth upgrading your entertainment set-up at home with a top-of-the-range new soundbar. Particularly if you own on of the latest 4K TV screens, it can be really worth investing in a device that'll deliver the top quality sound to match. Even the best Samsung TV can use help from a new soundbar. If you're one of those people who admires the slim aesthetic of your new TV over everything else, then a good soundbar is your best option. The best soundbars won't stick out next to your shiny new slim screen like a normal stereo system would – the they are built to be just as aesthetically pleasing as they are aurally pleasing. Not only are they slim and powerful, soundbars are also a good solution for smaller homes and rooms with little space that wouldn't be able to squeeze a 7.1 channel speaker system in. Despite most only featuring front-facing speakers, many soundbars are able to confidently project sound in a way that makes it seems as though there's booming audio coming from most directions. 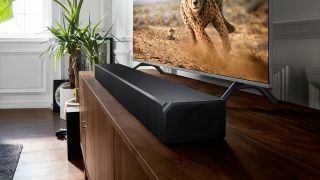 Read on below for the best soundbars available to buy in 2019, whether you're after Dolby Atmos support, multi-room audio, sleek design, or any variety of other advanced features alongside your soundbar's premium audio experience. Be afraid, traditional Hi-Fi speakers. Be very afraid. If $300 is your budget cap for a smart sound bar, then we highly recommend the Polk Audio Command Bar for any small or medium-sized living room. As you might be able to tell based on the soundbar’s design, the Command Bar comes with Alexa built right into it making it unquestionably smart. It’s also relatively inexpensive too, coming in at $250 (£249, AU$649), and it comes with a subwoofer. It has defined and powerful low end, some cool smart features, and looks pretty good, too.